For more than a decade the music industry has been struggling with online piracy. To prevent music from spreading like wildfire all the major labels have experimented extensively by adding DRM to digital music files. While this did little to stop piracy, the restrictions did hurt legitimate consumers. It turns out that consumers find music with DRM less attractive than the pirated alternative, and some people have argued that it could actually hurt sales. A new working paper published by University of Toronto researcher Laurina Zhang confirms this. For her research Zhang took a sample of 5,864 albums from 634 artists and compared the sales figures before and after the labels decided to drop DRM. “I exploit a natural experiment where the four major record companies – EMI, Sony, Universal, and Warner – remove DRM on their catalogue of music at different times to examine whether relaxing an album’s sharing restrictions impacts the level and distribution of sales,” she explains. This is the first real-world experiment of its kind, and Zhang’s findings show that sales actually increased after the labels decided to remove DRM restrictions. “I find that the removal of DRM increases digital sales by 10%,” Zhang notes. This effect holds up after controlling for factors such as album release dates, music genre and regular sales variations over time. Interestingly, not all albums are affected equally by the decision to remove DRM. Older albums selling less than 25,000 copies see their sales increase by 41% and overall lower-selling albums get a 30% sales boost. The top selling work, on the other hand, doesn’t benefit from less restrictions. According to Zhang, the 30% sales increase for lower-selling albums can be explained by the fact that DRM-free music makes it easier for consumers to share files and discover new music. The finding that removing DRM from top-selling albums has no effect on sales makes sense in this regard, since the discovery element is less important for well promoted musicians. 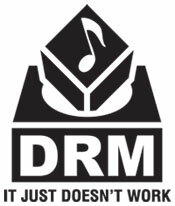 While DRM is still prevalent in the book industry and elsewhere, most of the major labels are now in agreement that it’s not a good fit for music. Those who look around will find that there’s hardly any music being sold with classic DRM in place. Even the RIAA admitted that DRM is an endangered species, probably because what the researchers report today is rather accurate. The late Steve Jobs already knew this a long time ago. “DRMs haven’t worked, and may never work, to halt music piracy,” he said back in 2007.